Does your bedroom feel personalized? You might not have given it much thought up until now, but adding personal touches to sleep spaces can be done in a variety of ways. Selecting a less-than-popular but personal favorite color, creating a gallery of family photos, filling the space with accoutrements from your travels, and adding your initials, better known as a monogram, are common ways to introduce a bit of yourself into a bedroom. Today we’ll focus on monograms –– motifs made from initials and often used to place stamps on personal items such as pillows, duvet covers, window treatments, and more. 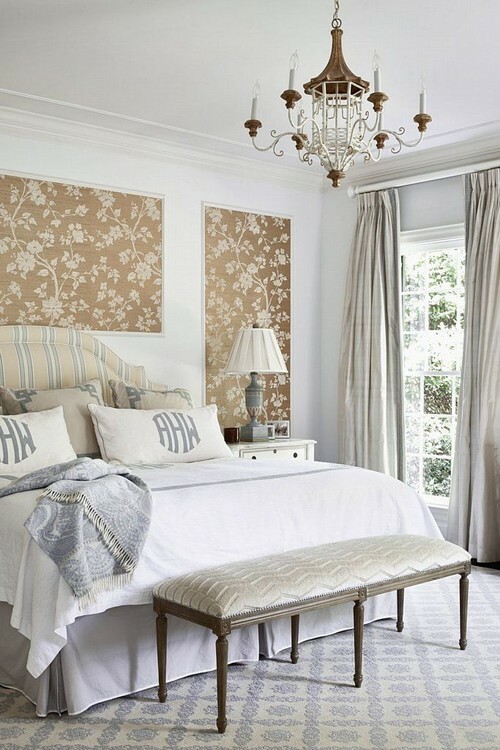 Continue reading for some lovely monogram inspiration in bedrooms. These twin headboards in a children’s room boast subtle monograms. 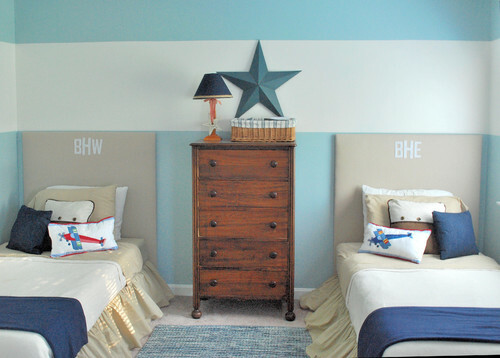 The lettering style works well with the bedroom’s simple, nautical theme. Crisp and clean, this Houston bedroom decked out in navy and white makes a statement with a monogram in the center of the bed covering. An elegant traditional space to sleep, this room keeps the color palette neutral but adds personal touches with monogrammed pillows and family photos on the nightstand. Whimsical and feminine, the monogrammed cornice and pillow create a second focal point –– the daybed being the first. The lilac walls and toile mixed with zebra are adventurous and prove successful. Any lady would be lucky to stay in this room. 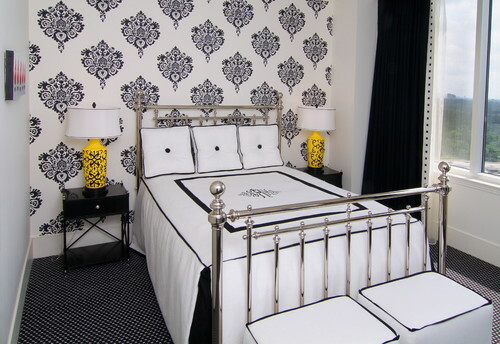 The designer used varying shades of gray with white accents in this calm, serene Texas bedroom. The monograms are less traditional than most –– using a single letter –– but the boldness grab’s your attention. 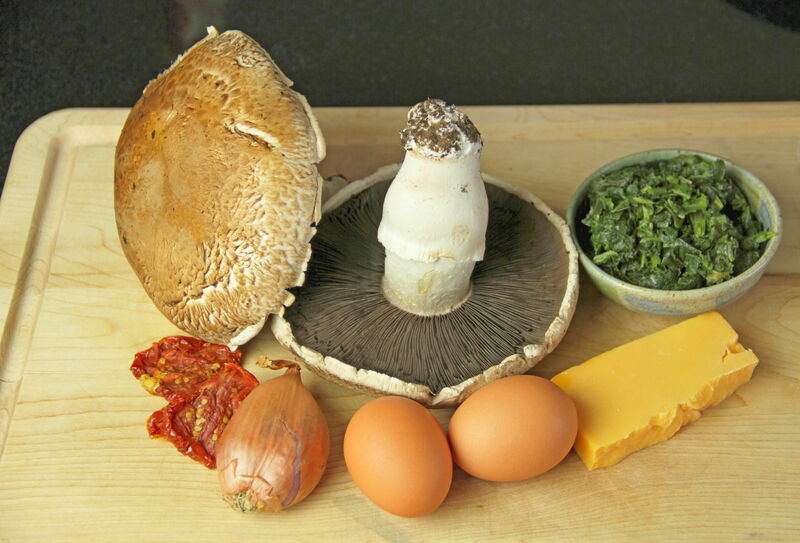 Ever try using a giant, meaty Portobello mushroom as a base for your breakfast eggs? Well, you should! Portobellos are large and stuffable. Their dense texture and earthy flavor make them filling and satisfying – a particularly nice ingredient for a vegetarian meal. In this recipe, I recommend acquiring a Portobello with its stem intact. 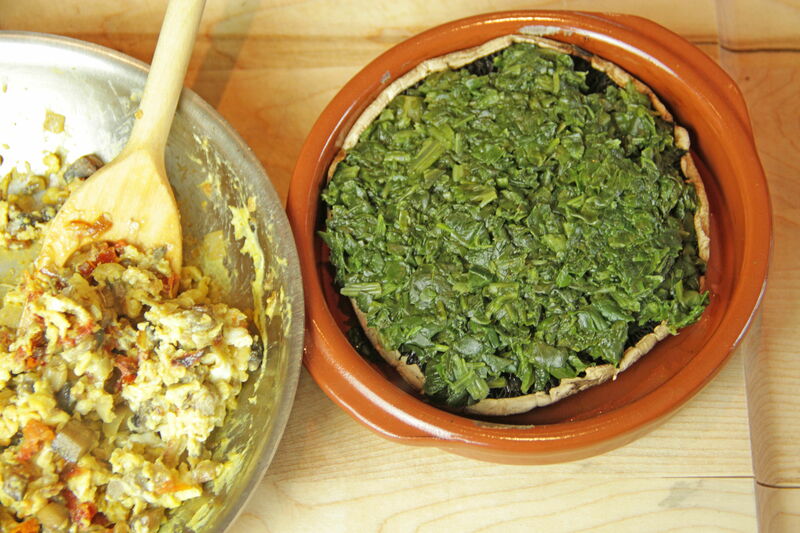 You can finely dice the stem and sauté it along with a bit of delicate shallot, and tangy sun-dried tomato. 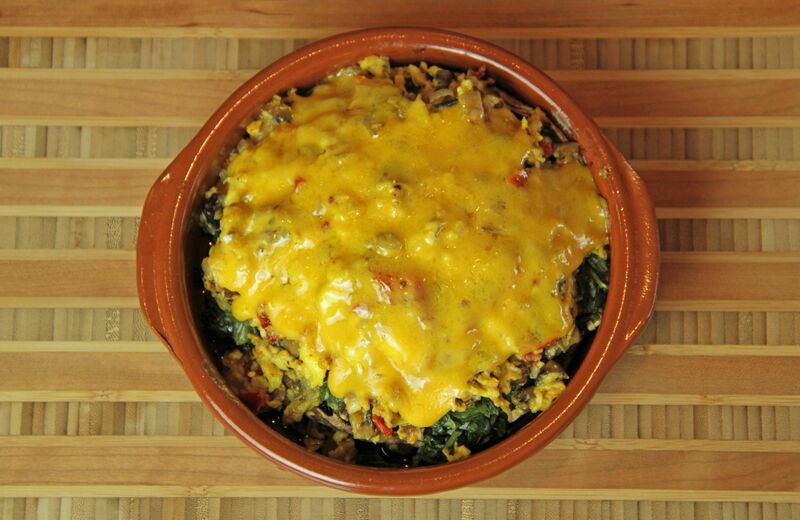 Scramble some eggs, add chopped spinach and melted cheddar. Voila! An entire meal stuffed into a mushroom. Don’t concern yourself about whether it’s Portobello, portabella, or portobella – they’re all the same thing – an overgrown relative of the common button mushroom, and the perfect base for your breakfast in bed. Preheat oven to 350°. Clean and trim Portobello mushroom. Remove stem by pushing firmly to one side, then the other. Chop stem into a fine dice and set aside. Brush the outside of the Portobello with a little olive oil. Place in an ovenproof dish and bake until cooked through but firm, about 15 to 20 minutes. In the meantime, heat the remaining olive oil in a small frying pan over medium heat. 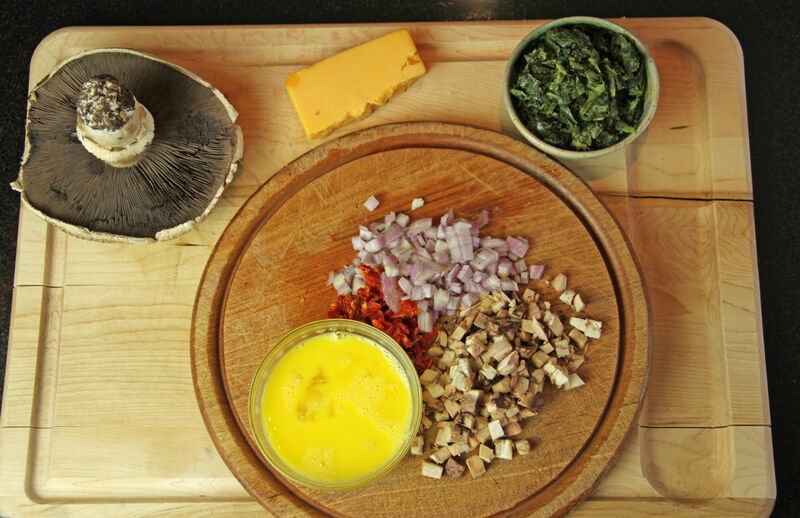 Add diced mushroom stem, shallot and sun-dried tomato. Sautee until softened but not browned, about 2 to 3 minutes. 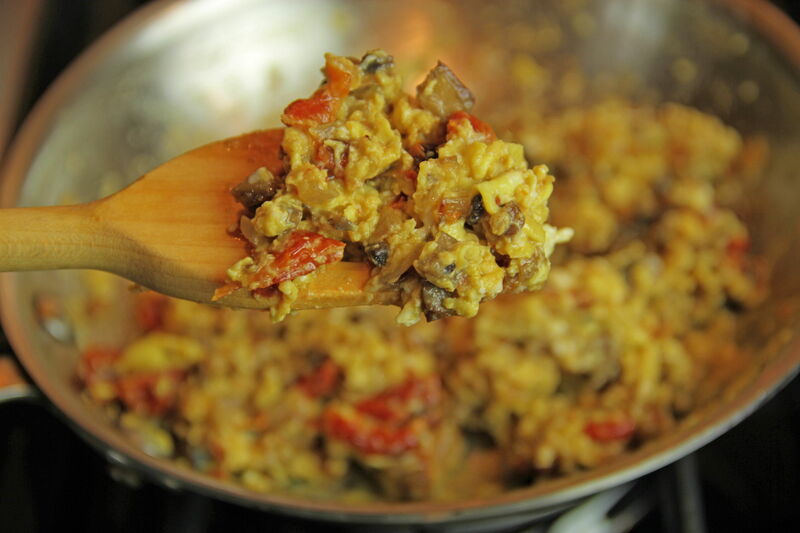 Reduce heat to low and add beaten eggs to pan. 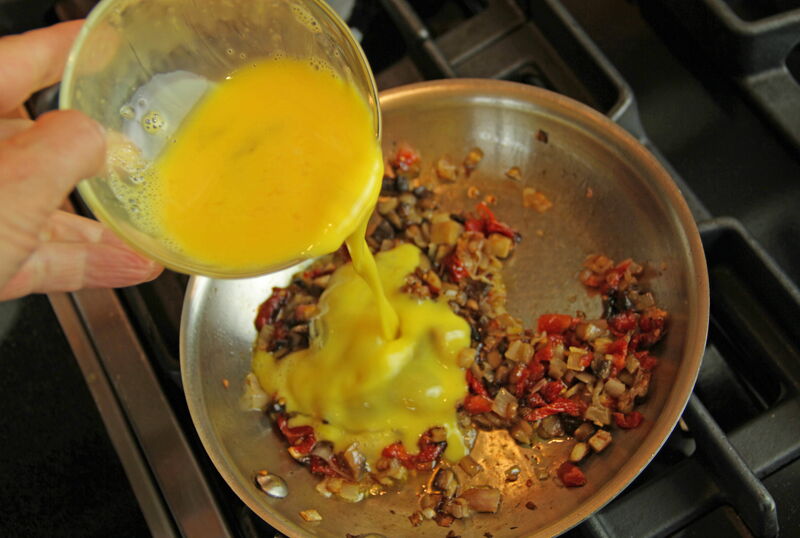 Continue to cook on low, gently folding and lifting egg mixture until cooked. Season with salt and pepper. 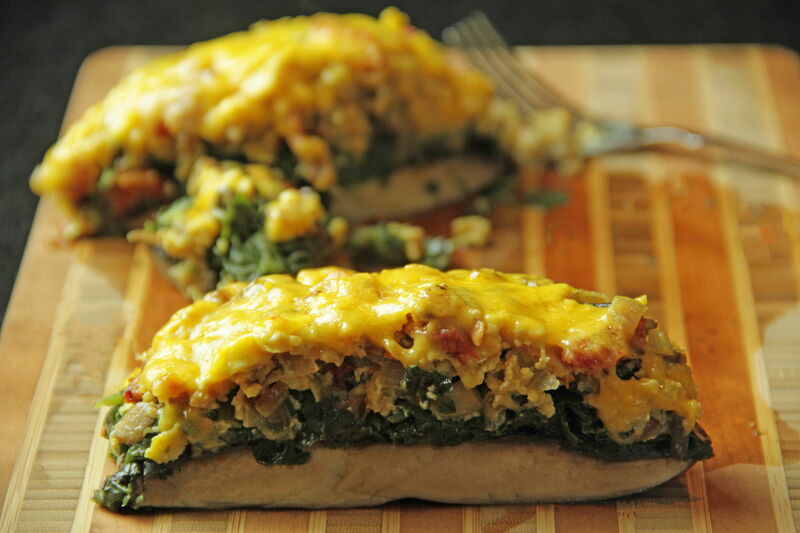 To assemble the Portobello, spread cooked spinach on top of the baked mushroom. Top with egg mixture and cheddar cheese. Place under the broiler until cheese is melted, less than one minute. Serve immediately. If you’ve observed design, furnishings, and graphics from the years 1933 to 1965, you’ve most likely seen the midcentury style. Characterized by the works of Eero Saarinen, Florence Knoll, Charles and Ray Eames, and other tastemakers from the period, the style and pieces are still prevalent today and often essential components in classically modern spaces. Open most any shelter magazine and you’ll usually come across elements and details that originated during this time in history. Typically mingled with other styles, mid-century modern can also be successful as the lone architectural style in a room, and avid fans of the aesthetic would agree. Sit back with a juicy season of Mad Men and flash back through these five fab rooms exhibiting mid-century design and flavor. 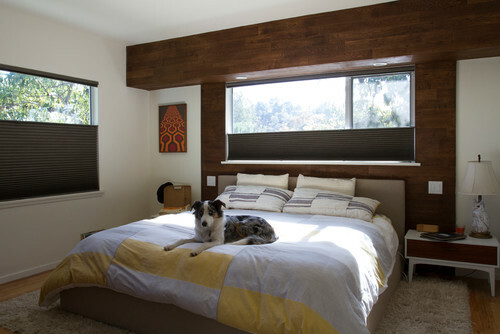 This open-air Los Angeles bedroom is a wonderful example of mid-century modern design. Without a doubt, the architecture is the star, and the rich wood creates warmth throughout the space. 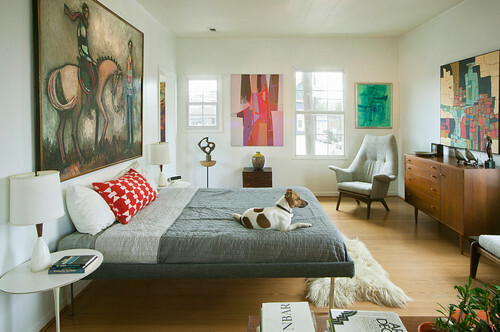 Houston is the home of this gorgeous bedroom boasting mid-century furniture pieces and modern art. Notice how every item is precisely placed. 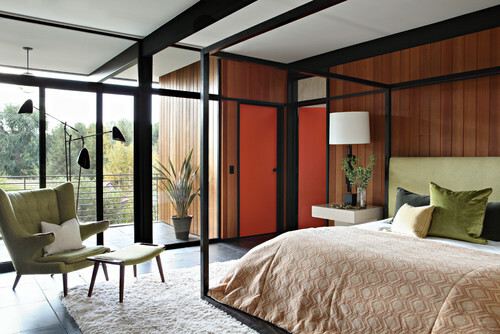 Orange paint on the door makes a splash in this California bedroom with mid-century accents. Sage green fabrics bring the outside into the room. Midcentury Bedroom by Los Angeles Interior Designers & Decorators Jamie Bush & Co. 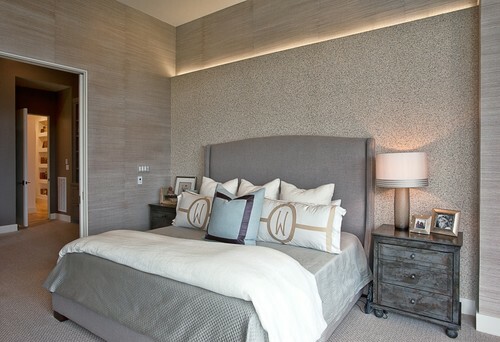 This bedroom is minimalist in design but showcases mid-century pieces. The modern wing chair creates a focal point, in an otherwise understated room. 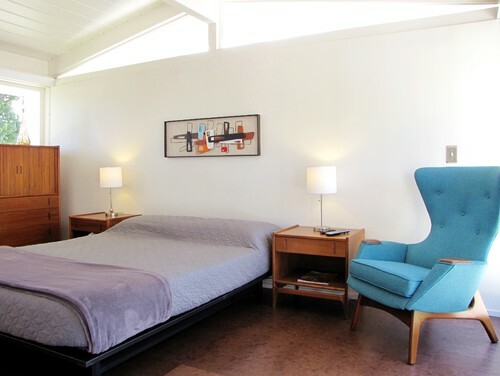 Another Los Angeles bedroom features the best of mid-century architectural design. This bachelor pad doesn’t feel too masculine because the shag rug and splashes of yellow soften the space, giving it a slightly feminine touch. At a recent McCafferty Family Reunion, we had the pleasure of having creative and talented Chef Michael Panza prepare a few meals for us. 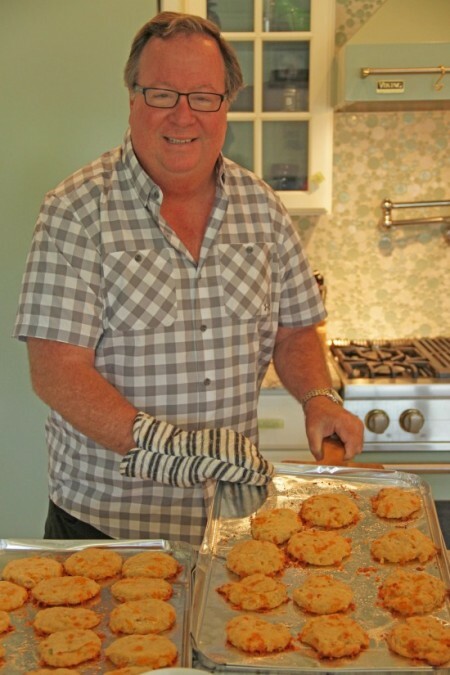 When asked if he would be willing to help with a breakfast post, Chef Michael readily complied, creating his spicy, southern-style take on biscuits and gravy. Chef Michael started preparing the night before, when he slow-cooked some extra barbecued beef brisket during our Friday night barbecue. 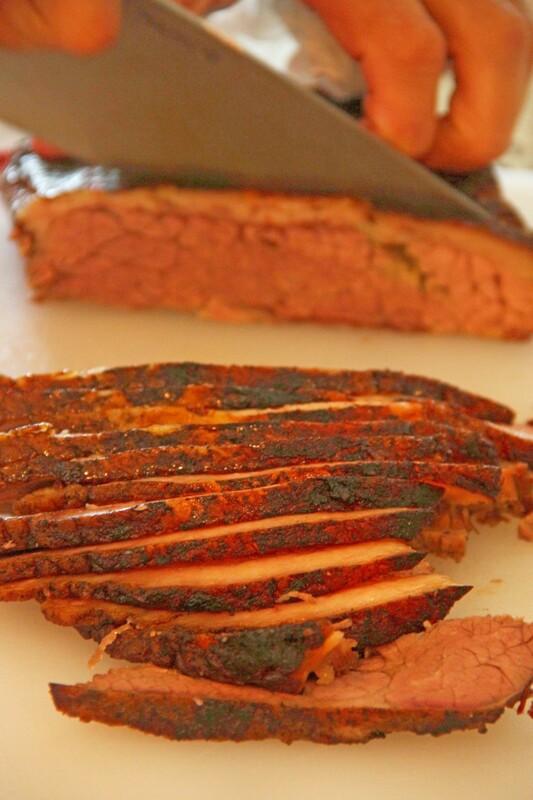 Then, on Saturday morning, he used the smoky brisket as a base for the rich and creamy gravy. To balance out the dish, he decided to spice up some humble biscuits with some fiery jalapeños and a touch of garlic. A little extra kick from some sharp cheddar filled out the biscuits and turned them a deep golden hue. 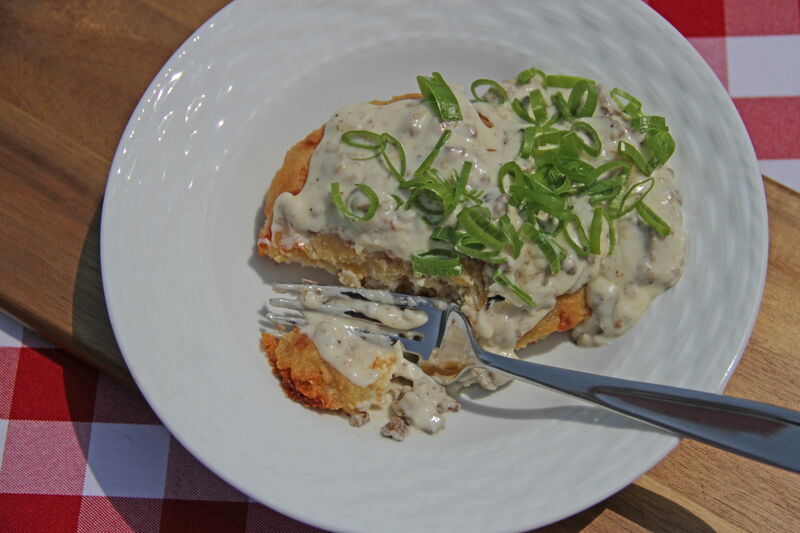 Hot, tangy biscuits, covered with rich, smoky gravy and colored with sliced green onions were a sight to behold. We all tucked into our meal, relishing the southern, spicy and special flavors; relishing the gift of Chef Michael’s breakfast. Wash, trim and seed jalapeño pepper. Dice finely and set aside. Preheat oven to 425°. Lightly grease baking sheet and set aside. 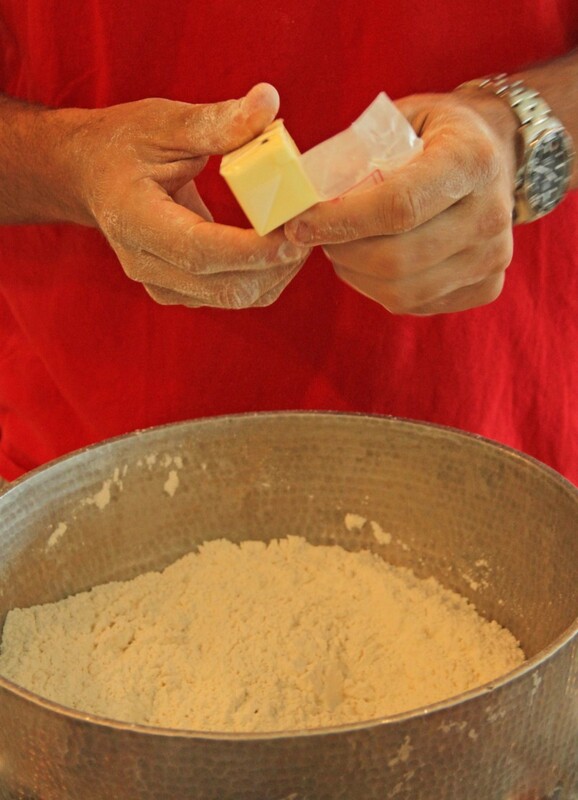 Combine flour, baking powder, garlic powder, and salt in large bowl. Cut butter into small pieces and mix with flour, using your hands, a pastry cutter, or two forks, until mixture resembles coarse sand. Pour buttermilk all at once into flour mixture, and stir until just mixed. Lightly stir in jalapeño pepper and cheddar cheese. 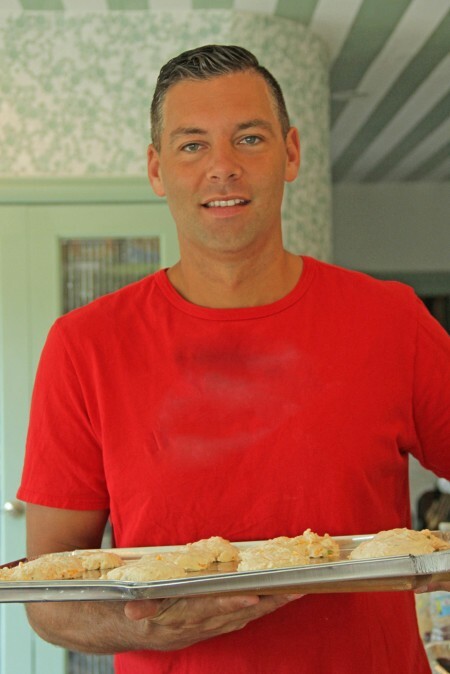 Melt the remaining 2 tablespoons of butter over medium high heat, and continue to cook until lightly browned. Set aside. 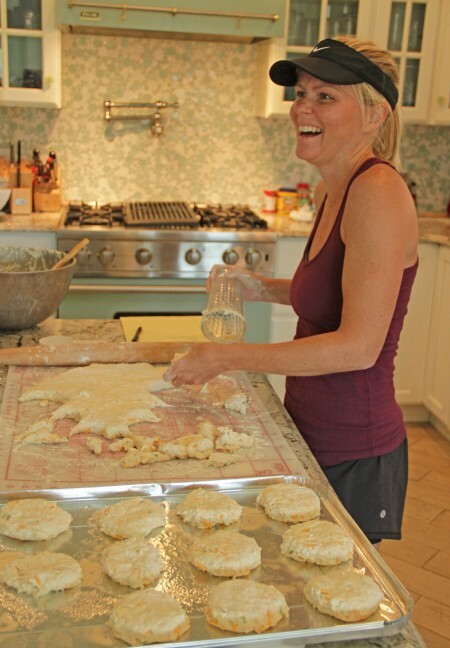 Drop batter onto prepared baking sheet using a greased ¼-cup measure. Bake until crispy and golden, 12 to 15 minutes. Brush with browned butter. Add vegetable oil to a medium, heavy pan and heat over high heat. 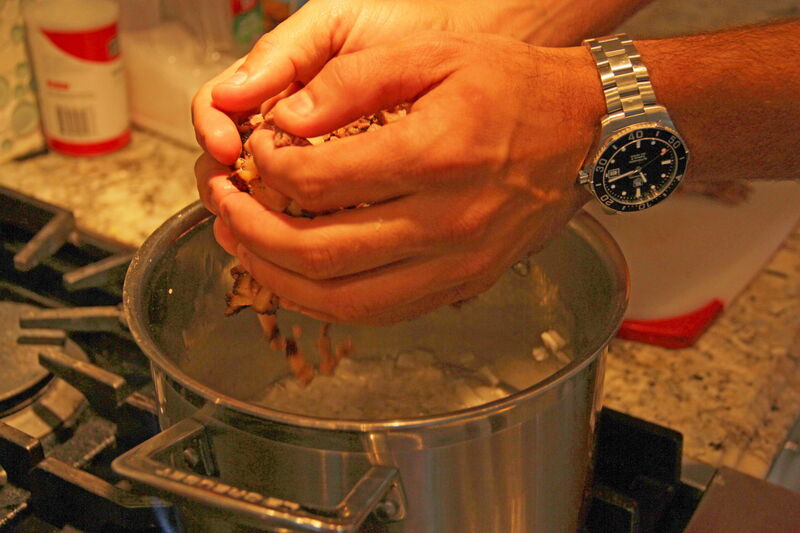 Add onions and cook, stirring frequently, for 1 to 2 minutes, until onion is softened. Add chopped brisket, and stir on high for another minute or two. 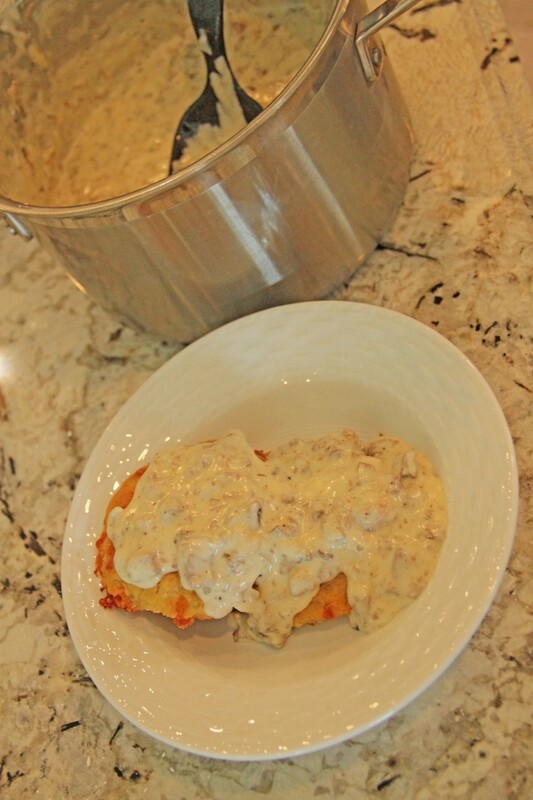 Pour in heavy cream, reduce heat to low, and gently simmer gravy for about 5 minutes. In a small bowl, mix corn starch with water to make a slurry. Pour corn starch slurry into gravy, whisking constantly, until gravy is thickened. Season with salt and pepper and keep warm until ready to serve. 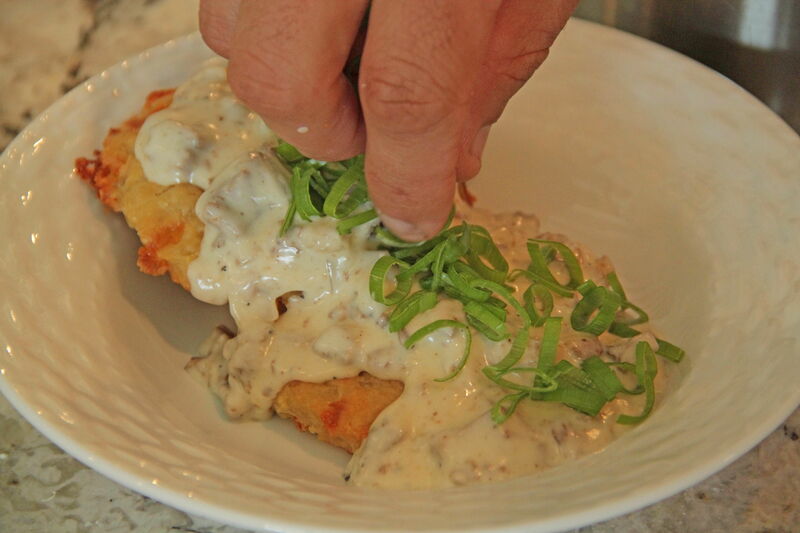 To serve, arrange biscuits on plates and top with brisket gravy. Garnish with green onion and serve immediately. I’m sure those who grew up in a different era would say theirs was a golden age of comic strips, but I really think growing up in the 1980’s and 1990’s was an unspeakably wonderful time for daily comics. The Far Side treated us to a daily dose of nerdy single-panel comedy, while the recently (yay!) revived Bloom County tackled politics and penguins. But for me, the nearest and dearest, as a young boy and now, will always be Calvin and Hobbes. Made all the more enticing and yearned-for because of Watterson’s refusal to license the characters for toys, much less posters and cards, and for his abrupt and total removing of himself from the public eye, these strips were the beloved of kids and adults alike. My son is about the same age as Calvin now. And there is hardly a waking moment that he isn’t buried one of the many Calvin and Hobbes books strewn about the house. It’s been great for me, as I haven’t visited these comics for a long time so I’m getting the chance to see them again while also enjoying them through his eyes, seeing them for the first time. Like Calvin, my son is a very imaginative only child. Unlike Calvin, he’s not a holy terror and, thankfully, he’s not getting any big ideas from Calvin. 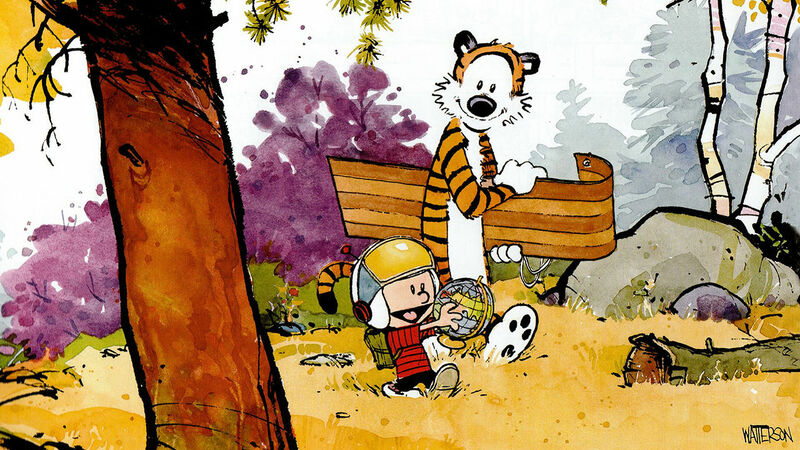 The balance of wry humor, philosophy, cynicism about the human race, and the unconditional love of his best friend the tiger makes this easily the greatest comic ever. If you haven’t picked up a collection in a while, now is a great time to do so. Curl up in bed with a volume tonight.